PLO Secretary General says the Palestinian leadership will convene this week to decide how to move forward with regards to Israel. 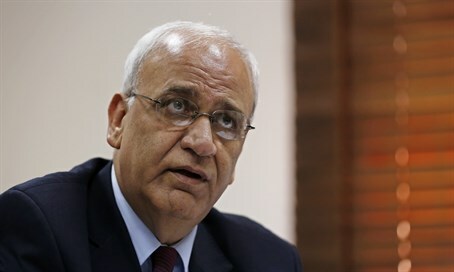 Palestine Liberation Organization (PLO) Secretary General Saeb Erekat on Sunday reiterated that the Palestinian leadership will soon make critical decisions regarding the relationship with Israel. In an interview with Hamas's Al-Risala newspaper, Erekat said that in the coming days there will be an extended meeting of the Palestinian leadership to discuss the implementation of the decisions taken by the Central Council of the PLO regarding interaction with the Israelis. He estimated that the decisive meeting will take place at the end of the week. In March this year, the PLO's Central Council decided to end the security coordination with Israel, and Palestinian Authority (PA) chairman Mahmoud Abbas warned in his UN speech in September that the PA was no longer committed to the 1994 Oslo Accords.